The Hyper Kitchen: Queen Wasp Go! 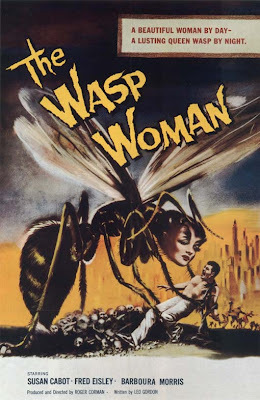 Hot on the heels of The Fly, came Roger Corman's rip-off The Wasp Woman. Dig this: Janice Starlin is an aging owner of a cosmetics line who insists on continuing to model her products, despite her vanishing good looks. Naturally, she seeks out an eccentric scientist experimenting with the rejuvenating qualities of Royal Jelly. Initially, the Royal Jelly-based formula seems to do the trick and Starlin gets her groove back. And then... Something Goes Terribly Wrong and Starlin transforms into a homicidal wasp woman. Hijinks ensue. As you can plainly see, the poster is a winner. It's classic: a shirtless guy in grip of a colossal queen wasp with the face of drowsy woman. The pile of bones is also a nice touch. Sadly, this scene never happens in the actual movie, nor does it accurately depict the wasp woman (which resembles Susan Cabot wearing an ill-fitting fuzzy wasp mask). A 1995 made-for-TV remake featured a creature that bore a stronger resemblance to the poster, but the movie as unwatchable its predecessor due to cheesy T&A shots and godawful CG special effects. Do yourself a favor and just watch The Fly instead. The Wasp Woman will just leave a sting. Still not convinced? Watch the trailer. Beg to differ with the Hyper Kitchen on this one Gordon . I thought it was a wonderful movie that showed man's basic inhumanity to man in clever yet fresh way . Particular note should be made of the dance scene at the end where the lizard bites it's own head off. A risky ,but tasteful and well executed vignette .